Buses going to Marin County pick up at SFO every 30 minutes, on approximately the hour and half-hour. No reservations are required. The first bus picks up at 5:00 AM, and the last bus of the night departs from SFO at midnight. (Please note that pickup times vary throughout the day due to traffic, passenger loads, and terminal location). Pick up locations for all terminals are outside of baggage claim, on the center island, at the green and white curb. Look for the sign that says “Airporters”. Please Note: Airport regulations require that buses pick up passengers ONLY at our designated pickup points. Our drivers are not allowed to stop for passengers flagging them down from any other zone. Need a Taxi when you get to Marin? 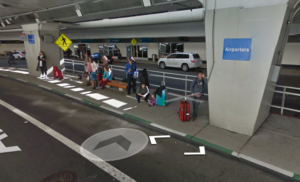 Airporter drivers will take taxi requests before leaving SFO, and will forward them to a local taxi company. Taxi requests for Central San Rafael & Hamilton will be taken before leaving the terminal at Andersen Drive in San Rafael. Please note: We cannot guarantee that a taxi will be available upon your arrival. Often there are far more requests for taxis than can be accommodated in a timely manner, resulting in delays. Marin Airporter regrets these delays, but we have no control over taxi availability or dispatch. Taxis are a limited resource, working hard to serve everyone. Some of the buses departing from SFO in the morning do not offer direct service to Hamilton. Passengers may be asked to wait at our Andersen Drive terminal for a connecting bus. 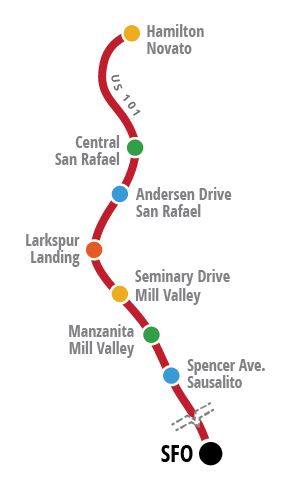 From 2:00 PM until Midnight, all buses from SFO offer service to Hamilton with no transfer. Information about short term parking at SFO can be found by clicking here.